ELIJAH SUMMER SCHOOL – A UNIQUE INTERRELIGIOUS EXPERIENCE! Summer Schools were the historical starting point of activities of the Elijah Interfaith Institute. They established Elijah’s reputation for grounding the teaching of religion in a deeper level of experience and engagement with issues of mutual concern, where the classroom functions as a place of authentic inter-religious contact. The major strength of the Elijah Interreligious Summer School is that academic study takes place not in isolation or in abstraction, but within an interfaith community of faculty and students, where the study of religious traditions is integrated with exposure to their lived spirituality. 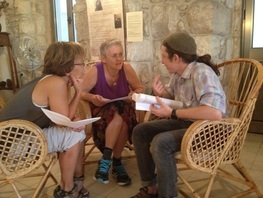 Using diverse learning techniques, including formal text analysis and the more creative bibliodrama, lectures and small group study, an Elijah Summer School is an intense encounter with oneself and with the other. Since our beginnings in 1997, Elijah’s activities have expanded and our vision to create a Center of HOPE, a House of Prayer and Education in Jerusalem, has begun to be realised. Until the physical building is established, activities such as this summer school will create communities of HOPE, laying the groundwork for the future. Our many partners in this venture, representing Christian, Muslim and Jewish communities in Jerusalem, are testimony to the HOPE we have for a shared future based on mutual respect and a commitment to learning from and with each other. The summer school will create a community which will live on beyond the experience of the summer.